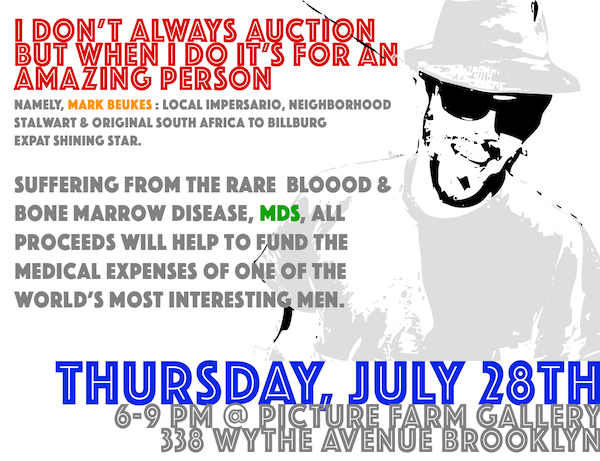 Mark Beukes has been a part of the local neighborhood art community for the better part of the last two decades and is now suffering from the rare disorder Myelodysplastic Syndromes. Juliet Kravchuk, Max Sternberg and a host of others are throwing a one-night party fundraiser to help him battle the this disease. There will be an amazing array of art on offer starting at incredible, below market prices in a silent auction to help with medical and cost of living expenses. There is currently a fund for Mark set up online, but this will be a great way to support and will offer up some incredible gems and a good time for a long time fellow community member.